Lucy with her grandchildren on the beach at Craigleith. About 15 years ago, when her daughter and son-in-law were expecting the arrival of their first child, Lucy purchased a small chalet in Craigleith, on the southern shore of Georgian Bay. The one-lane dirt road the chalet sits upon, with limited access to Georgian Bay, reminded her of the best part of her own childhood living on the shores of Lake Ontario. 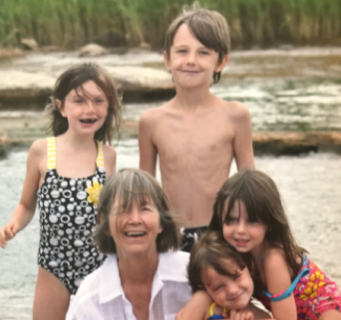 During the ten years following the purchase, four grandchildren arrived who, to her expressed delight, continue to enjoy visiting Craigleith as often their busy lives and schedules allow. In her work life, with a BA, BEd and MBA, Lucy has taught High School Science and French; installed Profit Sharing Plans, Pay Equity Plans and Idea Plans; and been a Corporate VP and Director of an international firm. She also founded a Not-For-Profit called, “The Tree Trust of Canada/Garde Foret du Canada”. Later, she served as Project Manager for a boutique consulting firm specializing in designing and installing asset management and profitability improvement systems for large enterprises, in the private and public sectors, in Canada and the U.S. She is now retired and living in Craigleith. As a member of the Trust’s Watershed Action Group, the WAG committee, she looks forward to supporting the Trust in its mandate to Preserve and Enhance the Blue Mountains. Watershed Ecosystem. She says this ecosystem is why most people come here and stay here. Some business strategists would identify this environment as the strongest competitive advantage this municipality has when compared to other communities along the Southern Georgian Bay shoreline. She adds that the Craigleith portion of this larger Blue Mountains ecosystem is under great threat because of the over-intensification of developments already in the works at the Town of Blue Mountains. Living by the water near Craigleith she witnesses the dynamics of the Watershed ecosystem. Seasonally, it is prone to the effects of spring run-off from the ski hills; erosion on steep slopes; silting into small streams and rivers; flooding and changing Georgian Bay water levels. She says, for a sustainable future for all who have already chosen to be here, and for all who will consider Craigleith their “market for goods and services”, their garden, their playground or their home in the future, Watershed Activists need to be vigilant, on behalf of ALL, to ensure that the ecosystem’s best features are preserved. Her goal is to help to do all we can to encourage well-managed and appropriate development in The Blue Mountains during the next four years, especially in Craigleith.